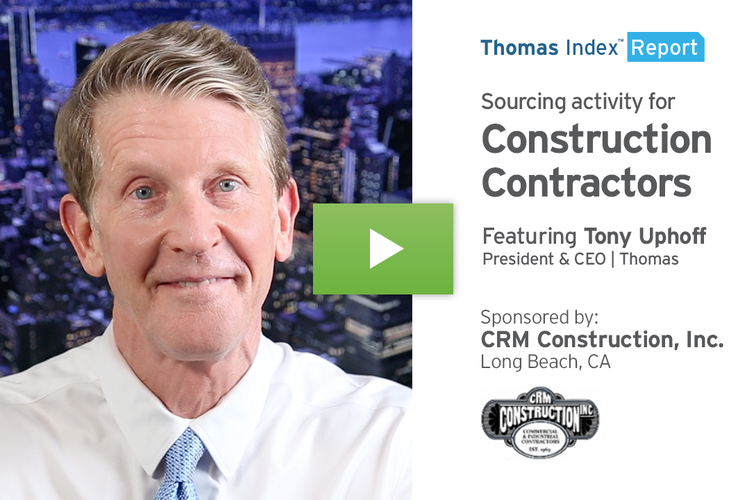 In this week’s Thomas Index we’re going regional – specifically, we’re going to take a look at sourcing activity in Southern California. This area is not just the entertainment capital of the world – it’s home to thousands of manufacturers providing over 800,000 jobs, according to the Southern California Manufacturing Group. We’ll look at what buyers throughout our network are sourcing from suppliers located in Southern California. Then, we’ll take a look at what products and services buyers located in Southern California are sourcing from suppliers throughout the Thomas Network at Thomasnet.com. For context, let’s take a quick look at that top ten categories being sourced throughout our entire network over the past 12 weeks. 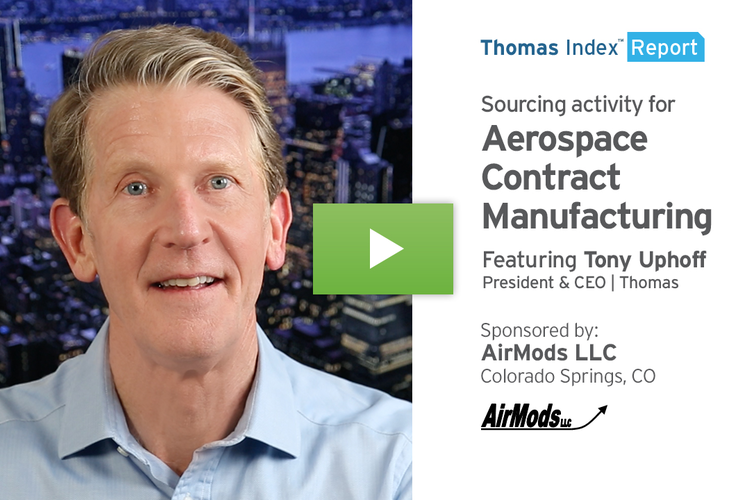 The list looks like this: Printed Circuit Boards, Injection Molded Plastics, CNC Machining, Metal Stampings, Corrugated Boxes, Steel, Contract Manufacturing, Machining, Metal Fabrication, and Sewing Contractors. Those are the top categories being sourced by all of our users, from suppliers across the U.S. and Canada. Topping the list is Contract Manufacturing for Nutritional Supplements and Vitamins. This category is booming driven by demand from an aging population, and an increase in health-conscious consumers. Next up is Contract Packaging for Bottle Filling, followed by Printed Circuit Boards. 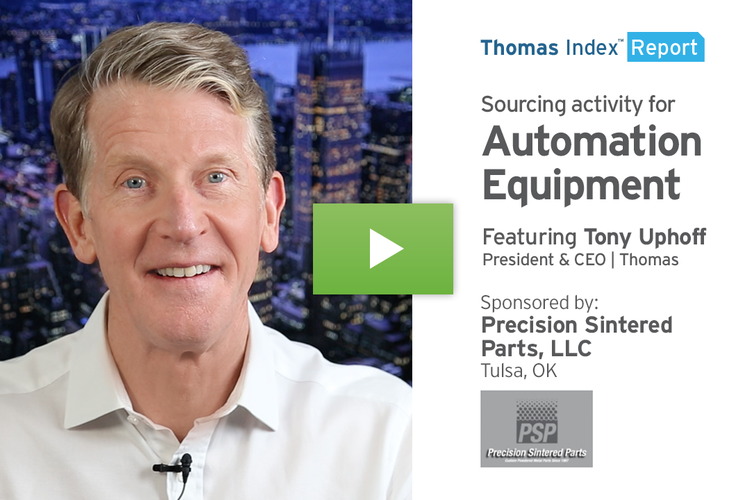 PCBs are clearly a hot category – as we just saw, they topped our nationwide list for sourcing activity. Contract Manufacturing for Cosmetics and Private Labeling for Cosmetics are the next two on the list. Cosmetics is another booming category, and makes up a large part of the 46 billion dollar beauty industry. 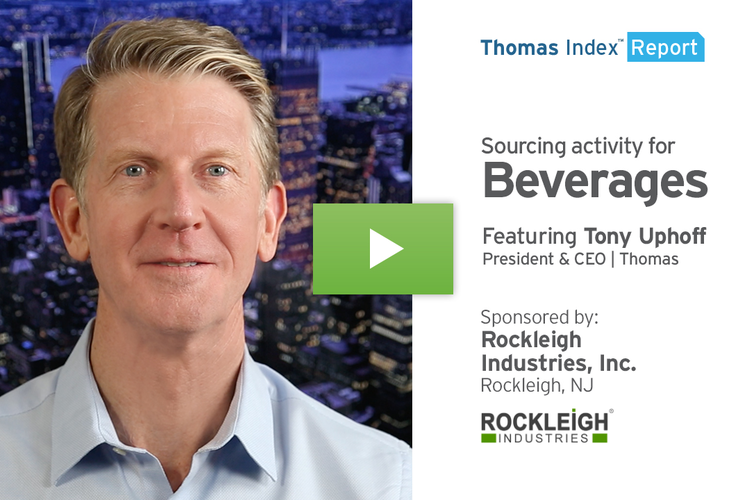 Sourcing for Electronic Manufacturing Services is next, followed by Plastic Bottles and Third Party Logistics Services, or “3PL.” We covered the upward trend in 3PL sourcing in a recent Thomas Index. Check out the new Insights section at Thomasnet.com to see that report. Rounding out the list is sourcing activity for Corrugated Boxes and Glass Bottles. Again, these were users from throughout our network sourcing those products and services from suppliers located in Southern California. Next, let’s take a look at what products and services buyers located in Southern California are looking for from suppliers throughout the Thomas Network at Thomasnet.com. This data will give you a good idea of what kind of projects are going on in the area. When you consider that buyers often want the logistical benefits of working with a local supplier, it’s no surprise that seven of the ten categories on this list align with our list of sourcing for suppliers in Southern California. Just like the national audience, buyers in Southern California are looking for Printed Circuit Boards, Contract Manufacturing for Nutritional Supplements and Vitamins, Corrugated Boxes, Contract Packaging for Bottle Filling, Glass Bottles, Electronic Manufacturing Services, and Plastic Bottles. Three product and service categories unique to this list are Steel Fabrication, Private Label Manufacturing, and Plastic Extrusions. If you’re a supplier in any of these categories, no matter where you are in the U.S. or Canada, there’s significant opportunity happening at Thomasnet.com. Beat your competition to the punch and get your marketing lined up to take advantage of this trend. Whatever your business, if you’re interested in a free custom report showing you which buyers are in-market today for the products and services you offer, visit Thomasnet.com/BuyerReport. 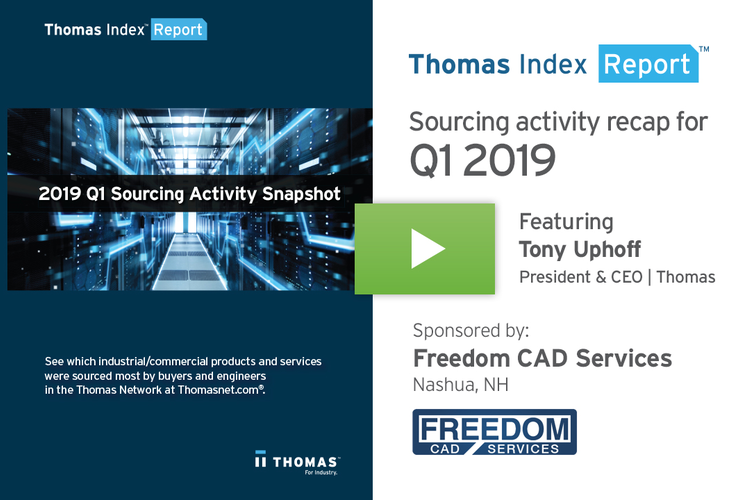 Hey, this was just a look at what our data shows for the past 12 weeks, and new trends are always coming to the forefront, so stay tuned to the Thomas Index. 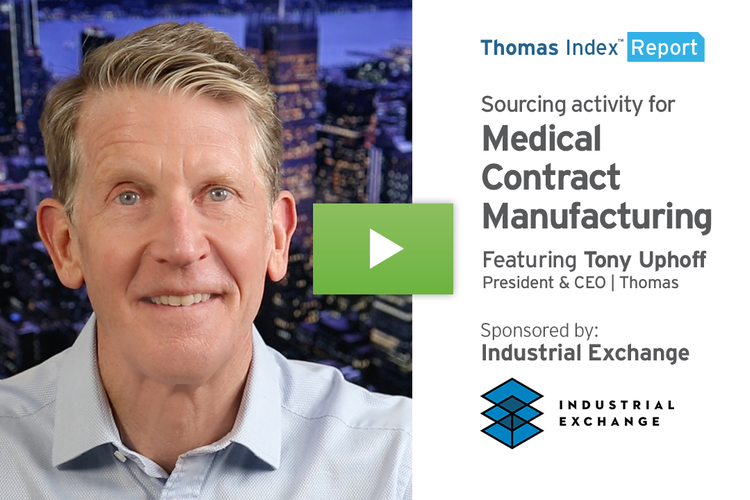 In the coming months, we’ll be highlighting sourcing activity in different regions of the U.S.